Hello everyone! I am excited to bring you another one of my trip reports! 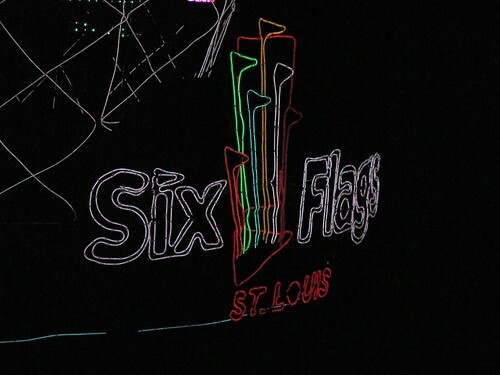 On Monday, July 19, 2010 I spent the day at my "home" amusement park, Six Flags St. Louis (formally known as Six Flags over MidAmerica) and I had the BEST time I have had at Six Flags in recent memory. I know that a large amount of you do not live in the mid-west area, so I would love to show you what this park as to offer in case you ever find yourselves in Missouri. Those on this trip with me were my boyfriend, Shawn and his 11 year old son, SM. 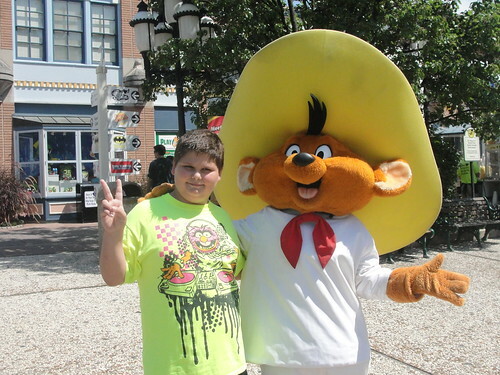 We took SM to Six Flags last summer for his first ever trip to an amusement park. It ended up being a pretty awful time (thunderstorms closed down most of the rides and he was too scared to go on a lot of things). We made up for his year! Six Flags St. Louis is NOT in St. Louis. It is actually a 45 minute drive from the city in a town called Eureka, Missouri. So we had a bit of a drive to get there. We first ate at the McDonald's that is right across the street from the park. Then we were ready to get there as the gates opened! Paid the $15 parking (premium parking costs $20) and found a good parking spot in the Daffy section. We made it through the medal detector, bag check, two ticket booths and finally into the main gates of Six Flags. While Shawn was in the bathroom, I was happy to take photo of some characters. I had never seen Speedy out before! Our first stop to was purchase the sports bottle that I had a voucher for. This sports bottle cost $10 with my coupon and we got free refills all day long. The three of us split it and got enough refills to make it worth the cost. The first ride we went on was Evel Knievel. This is a great wooden roller coaster. We walked right on. The next ride is one of my least favorites, Mr. Freeze. I am not sure if other Six Flags have this ride. It is a coaster that takes you through one loop then straight up in the air. It then drops you down and you do the ride again backwards. The que for this line took us longer to walk through than the line itself. Where is everyone??? We were getting super hot, so I suggested that we ride on Thunder River next. (the joys of being at a park that you have been to countless times is that you know all of the rides and where they are located. I didn't need a map at all). 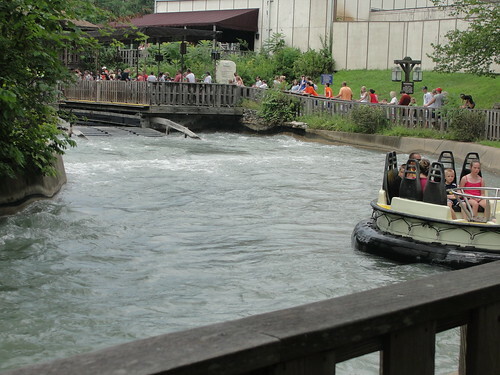 Thunder River is your typical "white water rapids" ride and yes we got soaked to the bone! Notice how short the line is??? Since we were already wet, we decided to go to the water park. Hurricane Harbor has been in with Six Flags St. Louis for man years now, but I have never gone. So it was something new for me. It is included with your admission price. 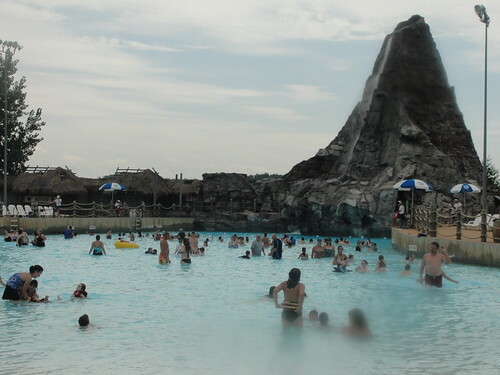 We spent a couple of hours there, mostly in the wave pool, although SM did go down a few water slides and goofed off in the playground area. Everything got really dark and the wind blow really hard. I noticed there was a line of over 100 people trying to get out of Hurricane Harbor. We decided to wait it out. It never did rain a drop! The winds died down and the sun came back out. But all of those people were gone! It was really strange. Back out into the Six Flags rides part of the park. We rode The Boss. I have been all over the place and ridden so many roller coasters, but The Boss at Six Flags St. Louis is my all time favorite. It is a wooden roller coaster with lots of speed and it lasts about 2 full minutes. Great ride! And for the first time ever in my life...there was no line!! We then were running from one ride to the next. No one was there! We literally walked onto every single ride in the park. Sometimes we got to ride more than once because no one else was behind us! We did Tony Hawk's Big Spin, The Screamin' Eagle (classic roller coaster), the Runaway Mine Train (been there since the beginning of the park), Rushstreet Flyer, Bumper Cars, Ninja (which they have covered the cars with Stride gum advertisement...very tacky! ), The Joker. SM rode Tidal Wave three times in a row! The guys also rode Excaliber and the Highland Fling but I passed on those because they typically made me sick. 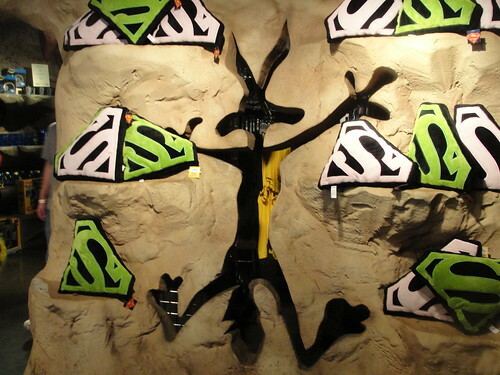 I wanted to ride Superman, but couldn't because I am too fat to fit into the safety harness. 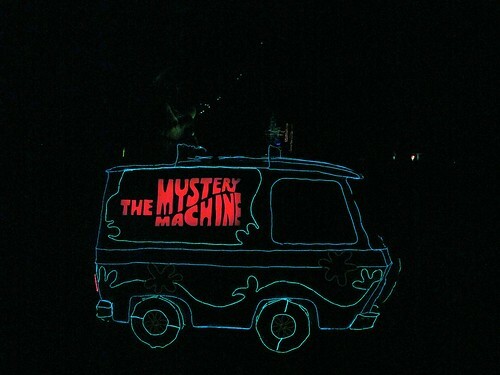 We spent so much time running around and doing the rides that I totally forgot about the show that I wanted to see. Oh well. We did slow down and do some browsing in the gift shops and stopped and ate at Papa John's pizza. 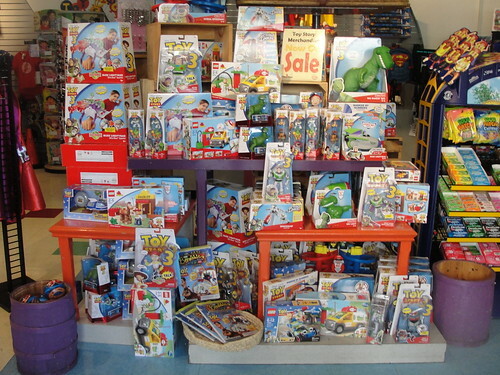 Lots of Toy Story 3 merchandise was on sale. The last thing we did was watch the "Glow in the Park" parade. We had missed it last year because it was canceled (due to rain). So I didn't want to miss it this year. I am not sure how many Six Flags have this parade, but it is a good one. 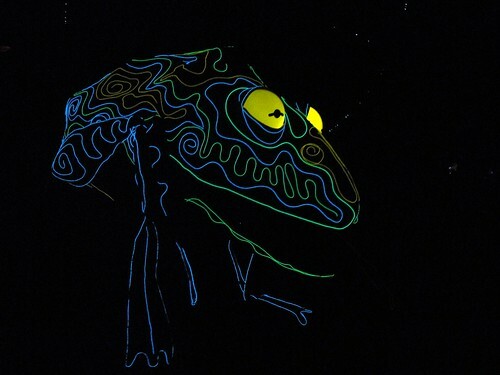 Keep in mind that it isn't the Electric Light Parade or anything Disney would put on, but still it was neat and fun and well worth sticking around for. Needless to say, I had a really great time at Six Flags. And I have to say that the park was MUCH cleaner than I have ever seen it (at least in the past 10 years). The hosts were very friendly. We were often asked what our favorite rides have been and everyone was smiling and helpful. 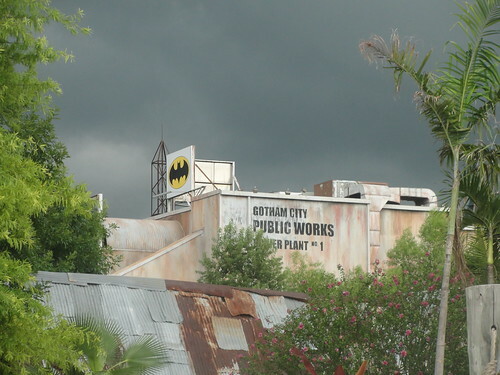 I hope that Six Flags is turning a new and better leaf. 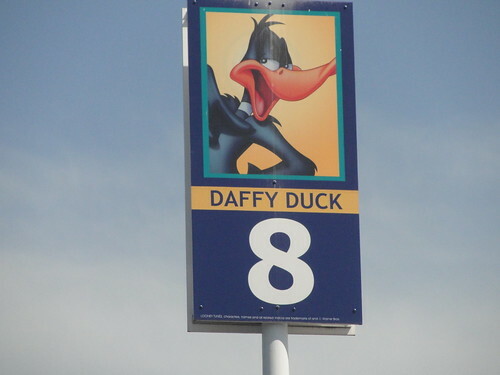 They will never be Disney but since I live so far away from the Magic, I will settle for a clean, friendly and nice Six Flags in the meantime. 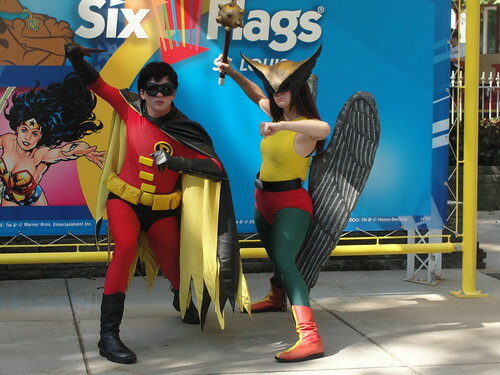 And so I will leave you with Robin and Hawkgirl. Thanks for this report! 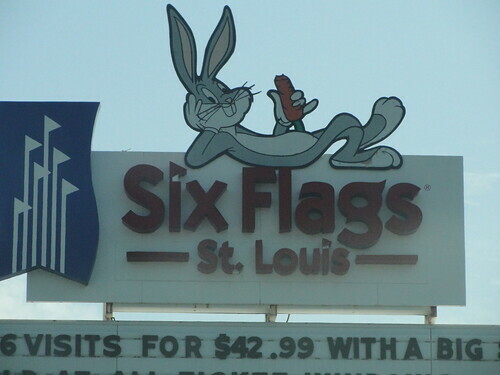 I'm considering going to college in St. Louis, so its nice to know there is a good theme park nearby. Is it possible to get there with public transportation?